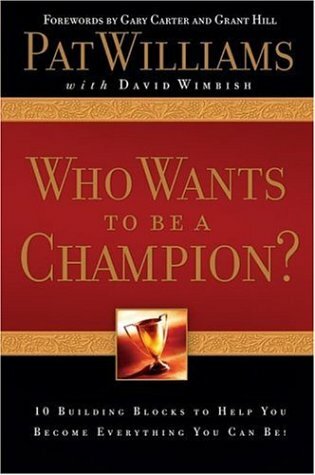 Who Wants to be a Champion? - 10 Building Blocks to Help You Become Everything You Can Be! <b>Pat Williams</b> is the senior vice president of the NBA's Orlando Magic as well as one of America's top motivational, inspirational, and humorous speakers. Since 1968, Pat has been affiliated with NBA teams in Chicago, Atlanta, Philadelphia, including the 1983 World Champion 76ers, and now the Orlando Magic which he co-founded in 1987 and helped lead to the NBA finals in 1995. Pat and his wife, Ruth, are the parents of nineteen children, including fourteen adopted from four nations, ranging in age from eighteen to thirty-two. Pat and his family have been featured in <i>Sports Illustrated, Readers Digest, Good Housekeeping, Family Circle, The Wall Street Journal, Focus on the Family, New Man Magazine</i>, plus all major television networks. In retail book business in brick and mortar walk in store for 40 years. Now offering personal library collected over 56 years of travelling and searching. Purchases made directly from Hudson's Bookstore may be paid only by personal or business check, cashier's check, or money order. Purchases made directly through abe will be processed by abe according to type payment received by them.